An estimated 400 people attended the fly-in/drive-in breakfast at the Albion Municipal Airport last Sunday morning, Aug. 11. 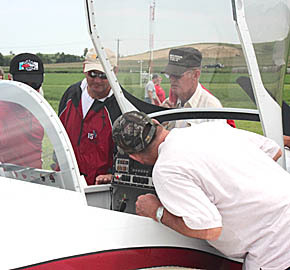 The event provided visitors an opportunity to have breakfast, view the airport’s new terminal/administration building and other facilities, look over a variety of aircraft, and even take an airplane ride. Details in the Aug. 14 Albion News Print & E-Editions.